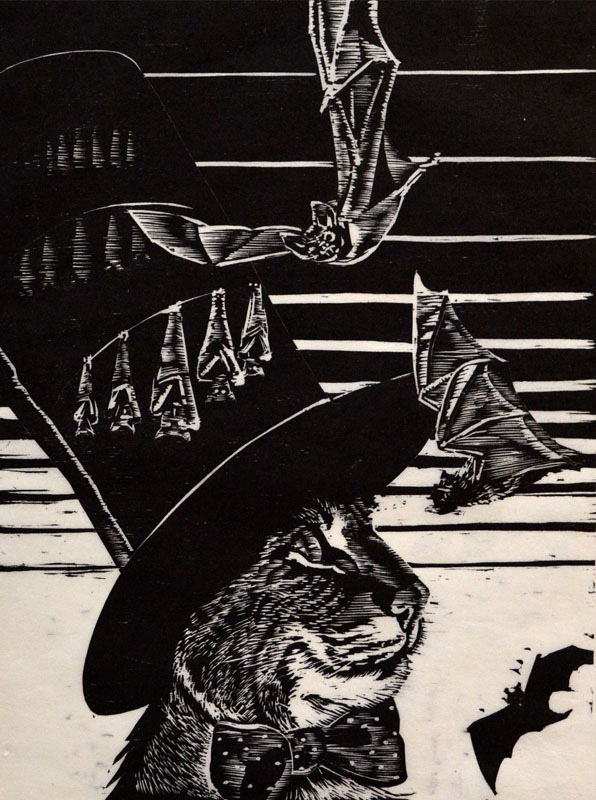 This subject—a cat with bats in its hat—called for the dramatic contrast typical of woodcut and wood engraving. For reference I used a bobcat, with its expressive features and striking patterning. This woodcut, carved with tiny gouges, has a level of detail more typical of wood engraving. My fascination with the printing process began in my early childhood, when I helped my father develop black and white photographs. I’ve exhibited my drawings and wood engravings throughout New England and have taught drawing, illustration, and relief printmaking at the University of Massachusetts, Holyoke Community College, and privately. I began my illustration career doing primarily scientific illustration, and have branched out to editorial illustration. I’m a member of Zea Mays Printmaking and the Boston Printmakers, and a co-owner of Collective Copies. Trained as a naturalist, I have enjoyed my recent experience as an artist in residence at five national parks in 2015-2016.